Peel the leaves off the tomatillos, rinse, and place on a baking sheet. Roast in the oven at 400 degrees F for about 15-20 minutes. Place the tomatillos with all other ingredients in a food processor and combine until desired consistency (less time = chunkier, more time = smoother). 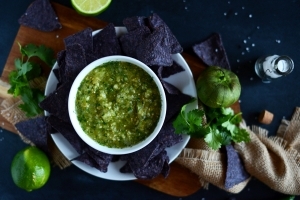 Serve warm or chilled with tortilla chips or over grilled chicken or fish.